The structure of Palazzo Arezzo is built in a neoclassical style and like most of the building in the neighborhood of Ibla, is extremely linear. This dwelling was raised in 1693 after the fatal earthquake that destroyed the city. Afterwards, the building was restored in the 19th century keeping the same aspect of today. What makes this place magical is the unique position facing the Duomo of San Giorgio, his long staircase and of course the square with the same name. 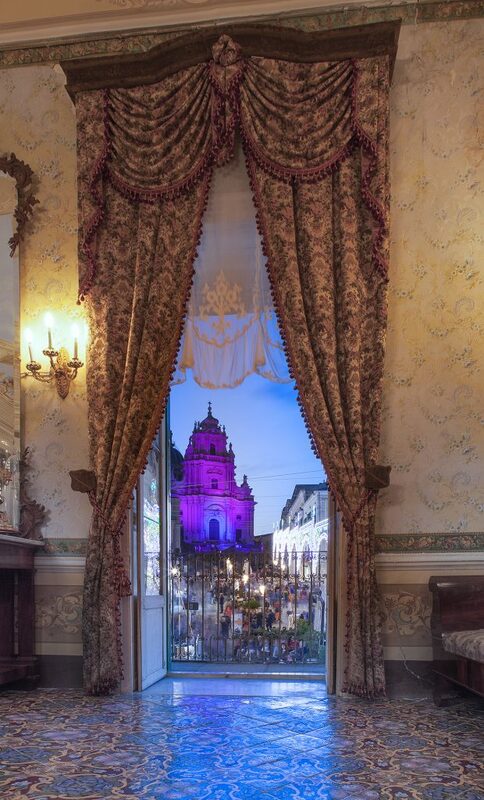 Imagine for a moment to be here enjoying the view of the most important baroque masterpiece of Ragusa, while on your back precious curtains seep in sunlight illuminating the epoch decors and the old Neapolitan majolica pavement. This feeling is just unique!